Beach volleyball has been among the fastest developing sports in the world and one of the highly anticipated and well attended during the Olympics. As we expect this to be the case in Rio de Janeiro as well, we dedicate today’s special report on the men’s beach volleyball tournament days before it commences. 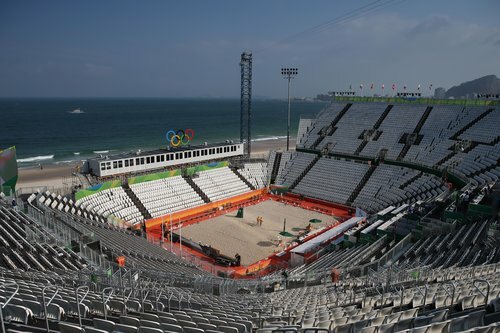 Copacabana is allegedly the most popular place to play beach volleyball and will host this year’s Olympic tournament. Situated right on the beach, the arena, with a capacity of 12 000, has a center court for competition, plus five training courts and two warm-up courts. All official matches of the program are scheduled to take place in the arena. The preliminary round includes pool play and will feature six groups of four teams each, making the total number of participants in the men’s event 24. We already presented you the draw here. The two highest ranked teams in each group and the two best third ranked teams will advance automatically to the knockout stage. The four third ranked teams remaining will face the lucky loser playoffs to take last two spots. The fourth placed teams in each pools will rank 19th in this competition. The losers from lucky loser playoffs will be tied 17th. The knockout stage will follow the single-elimination format. 1. Match points (2 for the winner, 1 for the loser, 0 for forfeit). To get a glimpse of what may happen in the tournament, we should first look back to the previous five Olympic Games. This is, of course, due to the fact that beach volleyball only made its Olympic debut back in Atlanta in 1996. It is a widely known truism that USA and Brazil are the powerhouses in the game and it is not a surprise that they have grabbed the gold medals four times out of five. The only upset happened four years ago at the Horse Guards Parade in London when the Germans Brink-Reckermann won in three sets against the favourites Emanuel-Alison from Brazil. I would surely put a Brazilian pair as the N1 favourite in Rio. Said Alison Cerutti now competes with Bruno Oscar Schmidt and their game has probably been better than anyone else since the World Championship 2015 in the Netherlands. The reigning world champions are the team to beat out there and enter the Copacabana event as a number-one seed. They demonstrate great shape in 2016 as well, having missed the first few events of the 2016 FIVB World Tour and having won the domestic Vitoria Open in March and the Porec Major in Croatia a month ago. The Brazilians usually win the finals they appear in, although they failed to win gold at the Moscow and Olsztyn Grand Slams. The only concerns regarding the N1 status of Alison-Bruno are not linked to their game but rather to the problems Brazilians sometimes have playing at home. The first two international events in Brazil in 2016, for instance, were not won by local teams, even if Brazilians won the Opens in Vitoria and Fortaleza later this year. Technically, Alison-Bruno are capable of winning the gold and Copacabana might resound with the Brazilian national anthem at the end of August should they use the home-court advantage well. Nicholas Lucena and Phil Dalhausser probably didn’t think they would be among the medal contenders in Rio when they rejoined forces about a year ago. In no time they managed to jump high in the international ranking, gathered enough Olympic points and even won some serious tournaments before arriving to Rio. As a matter of fact, the list of trophies for the two 36-year-olds is impressive – Xiamen and Puerto Vallarta Opens in 2015, Maceio and Fuzhou Opens and Hamburg Major in 2016. One would believe the two are just enjoying the last professional events in their careers but the reality is different – Dalhausser shows his 2008 Olympic form, whereas Lucena is playing the beach volleyball of his life. Forget their age and look at US Olympic history. These lads could pull a rabbit out of the hat. There are two more teams on which I want to set your focus and, in my modest opinion, should be added to the favourites list. Reinder Nummerdor and Christiann Varenhorst are reigning world vice-champions and deserved just as much as Alison-Bruno to win that final in The Hague. Interesting enough, the Dutchmen got a partial revenge in 2016 when they beat the two cariocas in the final of the Moscow Grand Slam in a no less entertaining encounter. Nummerdor-Varehorst are a team that can perform well when it matters. What they also have is one of the best offensive players in the world, Christiaan Varenhorst. Their problems mainly come from their recent form and that of Nummerdor, to be more precise. The veteran is one of the most experienced players in Rio but hasn’t played his best beach volleyball since the World Championship in 2015. Should the Dutchmen come close, they can win medals again. Latvia’s Samoilovs-Smedins is a tandem you would not like to expel from our list. The Latvians are two very interesting and universal players, with a lot of technical mastery and trick shots. FIVB World Tour winners from 2013 and 2014, Samoilovs-Smedins are peaking just in time for the Games. Janis Smedins suffered injuries that prevented him from taking place at the 2015 World Championship but those erratic days seem over for the guys from the Baltic Sea. Samoilovs-Smedins won the last international event before flying to Rio de Janeiro – the Klagenfurt Major, and added gold medals from the Olsztyn Grand Slam and the Antalya Open earlier this year to their 2016 collection. The quality of Aleksandrs Samoilovs to interact with the crowd should not be underestimated as the Latvians might even receive support from the local audience in case they need it. Above I presented four teams with serious chances to make it to the Olympic final. The list would only be exhaustive if we mention the other medal contenders or at least those who are expected to play a major role in the knockout phase. The first duo to start with comes from Brazil. Pedro-Evandro have never finished outside top 10 in any of the tournaments they have completed since their partnership began in 2015. I see no reason why the two should stay outside the top 8 in Rio either. Evandro is one of the toughest servers in the world and as of recently loves to change positions with partner Pedro Salgado, a trend shared by Samoilovs-Smedins and the Spaniards Herrera-Gavira. Pedro has played both as a defender and a blocker in his career and together with Evandro he forms a formidable tandem. The duo’s problems appear in medal games or semifinals when they often seem to enter psychological “gaps”. The newly crowned European champions Nicolai-Lupo from Italy are also capable of stepping on the medals podium. The Italians will depend on Paolo Nicolai’s serves and blocks, whereas Daniele Lupo is a solid defender and has influenced a number of games this season. Nicolai-Lupo are not touted as super favourites and this could be a great asset for the otherwise technically versatile Italians. The last team I want to emphasize on comes from Poland. And they are not Fijalek-Prudel! There are two youngsters who have a car full of medals, most of which collected from youth and junior continental and world championships. Bartosz Losiak and Piotr Kantor are younger than most of the other top-seeded teams and it may not necessarily be a disadvantage. The Poles entered the 2016 season on a high tide and won this year’s Rio Grand Slam. The weather conditions surely won’t disturb Losiak-Kantor that much as they have proven their value on the very same beach already. Besides, their tender age looks as an advantage based on what they have been showing so far this summer. Surprises await around the corner, of course. There are also other teams fully capable of beating any of the aforementioned in a single match. Watch out for Italy’s Ranghieri-Carambula and Carambula’s sky serves, Netherlands’ Brouwer-Meeuwsen, Spain’s Herrera-Gavira and Canada’s Saxton-Schalk. With a lot of the world’s best tandems soon to perform on Brazilian shores, it is more than clear that all six groups will be interesting. However, two of those six might be prone to surprises. Pool E will feature the Dutchmen Nummerdor-Varenhorst who start their Olympic campaign on 7th August against the Chilean cousins Grimalt. Later that evening Russia’s Semenov-Krasilnikov meet Poland’s Fijalek-Prudel in what promises to be an entertaining pool. Just as challenging will be in Pool F where the considered favourites Gibb-Patterson from USA will have a tough start against Qatar’s Jefferson-Cherif. Spain’s Herrera-Gavira were also drawn here and they will open their Rio account against Austria’s Huber-Seidl.